Among chemical industries, petroleum refineries have been identified as large emitters of a wide variety of pollutants. Benzene, toluene, ethylbenzene, and xylene (BTEX) form an important group of aromatic volatile organic compounds (VOCs) because of their role in the troposphere chemistry and the risk posed to human health. A very large crude oil refinery of the Baltic States (200,000 bbl/day) is situated in the northern, rural part of Lithuania, 10 km from the town of Mažeikiai (Lithuania). 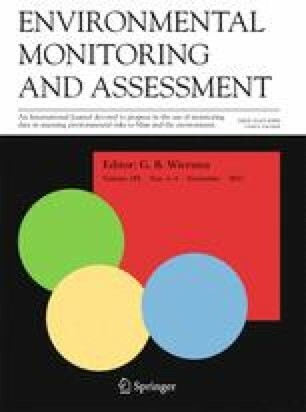 The objectives of this study were: (1) to determine of atmospheric levels of BTEX in the region rural and urban parts at the vicinity of the crude oil refinery; and (2) to investigate the effect of meteorological parameters (wind speed, wind direction, temperature, pressure, humidity) on the concentrations measured. The averaged concentration of benzene varied from 2.12 ppbv in the rural areas to 2.75 ppbv in the urban areas where the traffic was determined to be a dominant source of BTEX emissions. Our study showed that concentration of benzene, as strictly regulated air pollutant by EU Directive 2008/50/EC, did not exceed the limit of 5 ppbv in the region in the vicinity of the crude oil refinery during the investigated period. No significant change in air quality in the vicinity of the oil refinery was discovered, however, an impact of the industry on the background air quality was detected. The T/B ratio (0.50–0.81) that was much lower than 2.0, identified other sources of pollution than traffic. ATSDR, Agency for Toxic Substances and Disease Registry (1995). Toxicology information sheets. Available at: http://www.atsdr.cdc.gov/N. Accessed on 20 June 2010.